Cindy Heilman, MS, DTR speaks nationally on exceeding resident mealtime expectations in long-term care communities. 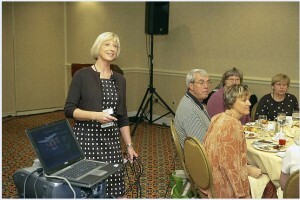 Audiences appreciate her upbeat style and active sessions. We have received positive feedback from EVERY person who attends the class. There are always a few staff members who stop and thank us for teaching the class and express how much they learned. We will continue promoting positive customer service through implementation of Kind Dining. Best class yet (this was mentioned on several forms). Excellent – hits all of the key topics. Great exercise at the beginning of the session – experience bad service. Great session. Fun and different. Great, practical ideas. Motivates me to review our dining standards with staff. The best session I attended at conference. I will be recommending you to all of our state affiliates and encouraging them to contact you to be a presenter for their meetings. 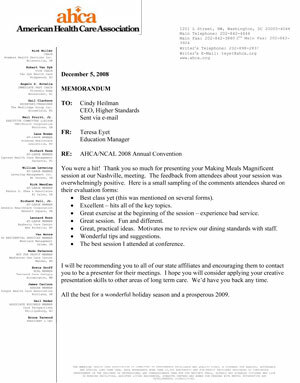 I hope you will consider applying your creative presentation skills to other areas of long term care. We’d have you back any time.